A compilation of available medicines and their preparation is called a pharmocopoeia. There was no such compilation in Sweden in the 16th century, and the need for one was not felt until the 17th century, which saw the rise of the first apothecaries. Apothecaries came from Germany at that time, and they brought with them pharmacopoeias. 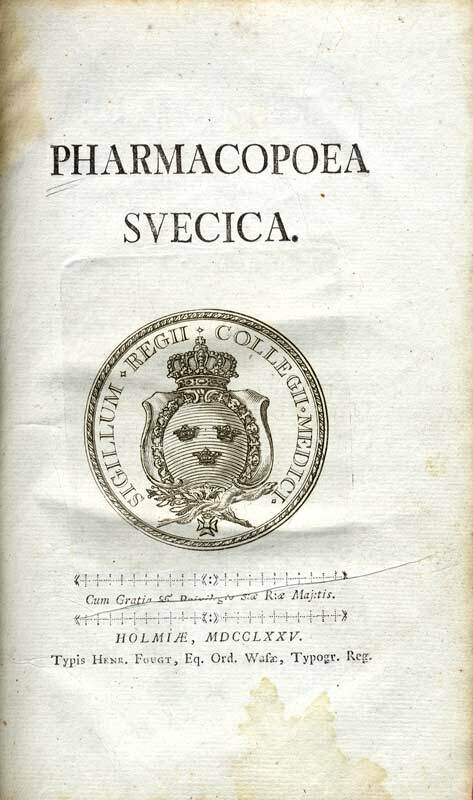 When the Collegium Medicum was established with its powers and responsibilities in 1663, one of the first priorities was to create a pharmacopoeia. A Pharmacopoea Holmiensis (i.e. Stockholm) was put together (1686). It was not widely distributed in the country, and the need for a more complete compilation led to court physician A. Bäck being commissioned ”to compose a new pharmacopoeia.” He was assisted by Linnaeus, who primarily contributed to the section on the effects and uses of medicines. This document, (Materia medica), contained some 380 simple substances, the section on “Praeparata et Composita” some 400 chemical preparations – as well as a list of substances to induce vomiting (emeticorum), compounds containing mercury, opium, and an alphabetical index. The pharmacopoeia also described how plant drugs should be dried, pulverization, etc. Pharmacopoea Svecica appeared in 1775, that is, three years before Linnaeus passed away.